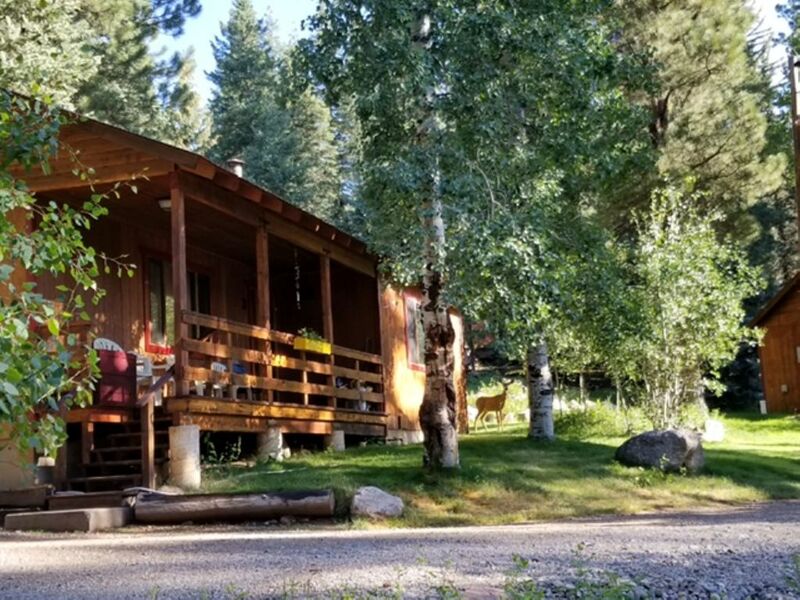 Super clean modern cabin with a full kitchen, living room, dining, large bathrooms, and 3 bedrooms located 1/2 mile from beautiful Lake Vallecito. We have a 4 night minimum June, July & August. September - May we have a 2 night minimum. The kitchen is equipped for full time living, with all appliances, including a dishwasher, toaster, coffee pot, and blender. Everything is in place, all you will need is food and personal items. There is no maid service but fresh linens and towels are provided when requested. Satellite TV, DVD player with free Wi-Fi, ceiling fans in living room and bedrooms. Living room and bedroom windows look out to a wooded area. It's not uncommon to see a critter from those windows. See photos for an example. You have your own private deck to enjoy the lovely outdoors. Lone Wolf Cabins & Getaway, where the stress of the world melts away. We are located in the heart of the San Juan Mountains at beautiful Lake Vallecito Colorado. For your adventurous lifestyle we are open year-round with clean, fully furnished, comfortable cabins. Whether it’s for a wedding, family reunion, anniversary, birthday, holiday or just a retreat, we have the perfect cabin for you. On site we have 3 one-bedroom cabins, 2 two-bedroom cabins and 1 three-bedroom cabin. All cabins include fully stocked kitchen, bedroom, bathroom and living room. All you need to bring is your food, toiletries and clothes. There are picnic tables and park style charcoal grills for each cabin. In addition, we have 2 vacation homes nearby that offer a little more seclusion. Our yard is park-like nestled in the tall pines. With plenty of space you can enjoy horseshoes, tetherball, yard dice, or play with your dog in the large grassy yard. For your little ones we have a swing set and a sandbox with toys. Pick a firepit to enjoy the cool and calm evenings. Don’t forget your marshmallows! There’s never a dull moment when you visit Southern Colorado! You can dine at the four local restaurants, most of which are in walking distance. Depending on season, rent a boat at the marina or ATV/snowmobile at the base of Middle Mountain road. There are trails and fishing galore as well as hunting and exploring. In the winter there is cross-country skiing and ice-fishing. These are a few of the endless activities Lake Vallecito has to offer. There are many other attractions in the Southern Colorado area. Just a few ideas to explore are Four Corners Monument, Mesa Verde National Park, Historical Durango Narrow Gauge Railroad, The Million Dollar Highway, Purgatory Ski Resort, Wolf Creek Ski Area, Pagosa Hot Springs, The Bar D Chuckwagon and so much more. We had so much fun! Mark and Danielle were amazing, they were very helpful and always seemed to be around when we really needed them! I was really impressed with this cabin! It was very clean, cozy, and welcoming. It smelled great upon arriving as well. We will definitely be returning! Thank you for your review! We hope you see you back again soon! We are so happy that you and your family enjoyed your stay! We hope you can visit again soon! We had a lovely time! Beautiful scenery and quiet. Clean house. Thank you for your review! We hope you and your family visit us again soon! I enjoyed my weekend with loved ones, made memories and overall, satisfied with the stay and staff! Thank you for your review and for staying with us. We are happy you enjoyed your stay and hope to see you and your family back again soon! Loved it!! Awesome customer service! The best time ever! We will be coming back every year . great family expirence. Lone Wolf Cabins are located in the near Weminuche wilderness area surrounded by tall pine trees with Lake Vallecito 1/2 mile away. We have numerous wildlife walking through our property. Great place for family reunions.